Purpose: Traditionally, complicated diverticulitis with fistula formation was thought to be a contraindication to performing laparoscopic sigmoid resection and was performed with an open procedure. As experience in laparoscopic surgery increased, more complex surgery was performed laparoscopically in selective patients. Since 2004, our institution has been offering laparoscopic colectomy to all elective patients presenting with diverticulitis including diverticular fistulas. This is a study evaluating the outcomes for consecutive patients who had complicated diverticulitis with fistula formation who underwent elective laparoscopic sigmoid colectomy. Methods: All patients with diverticular disease with fistula formation from 2004-2008 were offered laparoscopic colectomy. Data for this patient population were collected by chart review and analyzed retrospectively. Results: Between November 2004 and September 2008, 22 patients (13 females and 9 males) with an average age of 59 years were identified. All cases were managed by one of two colorectal surgeons at one institution. One male patient was excluded from the study because of a diagnosis of a colon cancer at the time of surgery. Of the 21 patients in the study all had fistulae including, 12 colovesical fistulas, 4 colovaginal fistulas, 3 enterocolonic fistulas, and 2 colocutaneous fistulas. The mean operative time was 185 minutes, and the conversion rate to an open procedure was 19% (4/21). A total of 4 early postoperative complications occurred in 3 patients including ileus (n=2), and pneumonia (n=1). Late complications were experienced in 2 patients, both with wound infection (n=2). Conclusion: Laparoscopic colectomy for all patients presenting with diverticular fistulas is safe with minimal morbidity and an acceptable conversion rate. 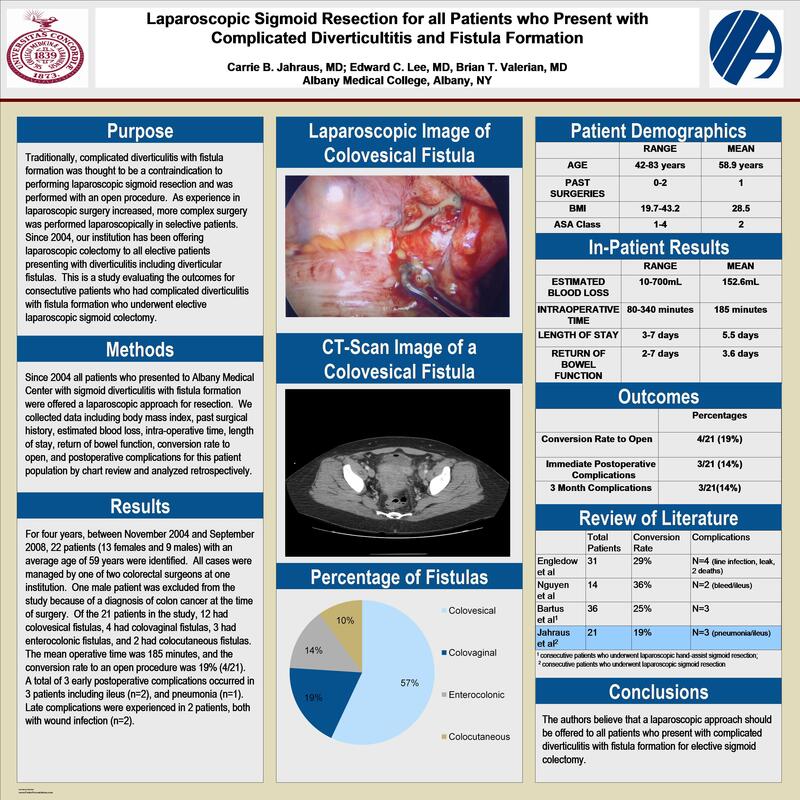 We believe that a laparoscopic approach should be offered to all patients who present with complicated diverticulitis with fistula formation for elective sigmoid colectomy.